"I told my family that I was going to stand up and shake my president's hand — out of respect for him and our leaders and our nation." Thomas Gunderson helped people to safety on Sunday outside the Mandalay Bay Resort and Casino. 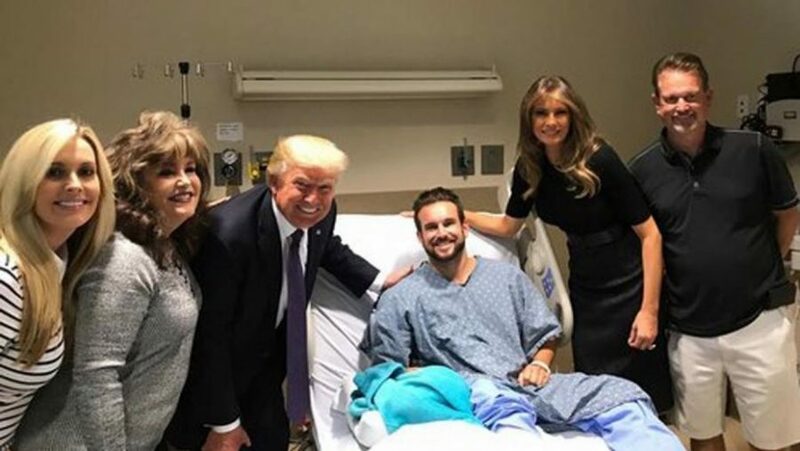 He was visited by President Trump and the first lady. When Thomas Gunderson first heard the noise he thought a speaker had malfunctioned — or maybe someone had shot off some fireworks. But then he heard the screams — and the 28-year-old from Newport Beach, California realized he was standing in the middle of a killing field. Thomas Gunderson heard the first gunshots, he jumped into action — helping people to safety outside the Mandalay Bay Resort and Casino. In the early moments of the Las Vegas massacre Thomas joined other concert-goers to evacuate people to safety. “There were a lot of people helping and risking their lives for others,” Thomas told me in a telephone interview. In the midst of the chaos and carnage, Thomas kept wondering if what was happening was really happening. “We heard the rounds going off but we kept thinking, it’s fake, it’s fake,” he said. A split second later, a bullet plunged into Thomas’ leg. Thomas said he dragged himself behind a row of bleachers. In a matter of minutes, two young women came upon Thomas and administered life-saving first aid. One of the women wrapped a belt around his leg, while the other got some men to carry him to safety. Thomas considers himself lucky. The bullet went through and through. He suffered torn muscles in his calf and nerve pain, but the bullet missed bone and arteries. “It’s hard to stand — very painful,” he said. That makes what happened on Wednesday even more remarkable — he received a visit from President Trump and the First Lady. “It was one of the greatest moments in my life,” Thomas told me. And even though he was in severe pain, Thomas was determined to stand up and greet the president. “I told my family that I was going to stand up and shake my president’s hand — out of respect for him and our leaders and our nation,” he told me. And that’s exactly what Thomas did — grimacing in pain as he greeted the president and shook his hand. A Facebook video documenting the poignant moment has been seen by more than a million people. “This guy looks tough to me,” the president declared. “That was one of the most humbling experiences of my life — the fact that the president would take time to come here and just shake my hand and to let him know if I needed anything,” he said. It was a deeply heartfelt moment between a patriotic American citizen and his president. It was a gentle reminder that we are a united people — one nation under God. God bless you, Thomas Gunderson. It’s so good to read something so upbeat, with goodness and honor and love.